It seems like every day there is just one more thing that all of a sudden your iPod touch, iPhone or iPad is able to do. Read an ebook? Theres an app for that. Watch a live ball game on the go? Theres an app for that. Play a zillion different games? Check on that too. And now you can even use your iDevice to accept credit card payments quickly, securely and without having to make the major investment in a credit card processing machine that small businesses and entrepreneurs used to have to make. Apple sell the Square credit card reader for iDevices in the Apple stores both on and off-line. Basically for just $9.95 (which I pretty much offset by the ten dollar account credit you get) you receive a small magnetic card reader that plugs right into the headphone jack of your iPad 1 or 2, iPhone 4 or any iPod Touch that is 3rd Generation or up. When a credit card is swiped the electronic information contained in magnetic strip is converted into an audio signal. This audio signal is then automatically picked up by the I Device’s microphone, processed and the routed stright to the Square iOS app. The data in encrypted form is then sent to the back-end servers where it communicates with the various payment networks. The app then prompts the user (ie your customer) to sign on the iOS device’s multitouch screen and asked whether they prefer a receipt via email or SMS text message . If the transaction is successful, you promptly get the receipt of the transaction by SMS text or email as well as the one sent to the customer. No paper reciepts, no hassle, its a win win on both sides. The money is then transferred to whatever bank account you choose to add to your Square profile. The whole process takes just a couple of minutes. There are fees attached to the use of the Square app and card reader just as there are for a normal credit card processing machine. Currently that fee is 2.75% of the transaction which is actually lower than many traditional credit card processors are charging these days. Why is the Square app so buzzworthy? Because its lets small businesses begin to take credit cards from day 1 if they so desire. Vendors can take credit cards at outdoor flea markets, craft fairs, anywhere they please. At a time when people carry less cash than ever before if they can pay by credit card at these kinds of events then they are likely to spend more! Another place the idea of a credit card reader like the square is catching on is in smaller restaurants and cafes. Waitstaff can take payments right at the table, with everyone connected to the same Square account. It is faster for the wait staff and customers like it as well as they can watch the transaction and receive an instant receipt in the in their email, no little pieces of paper to keep track of. Square is the Apple version of the iDevice credit card reader and it was one of the first but it is no longer the only one. Any great idea is bound to grow and that is certainly true in this case. Intuit have got into the ipayments arena with their Go payment credit card reader. 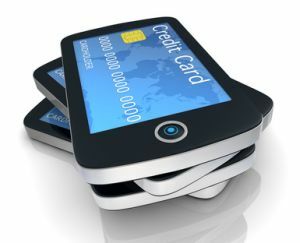 In this case the reader works not only with the iPhone 3 and 4 and iPad and Gen 3 and 4 iPods and up but with Blackberry devices and a growing number of Android smart phones as well, bringing mobile credit card payments to an even wider audience. The GoPayment card reader is free as is the app that powers it. Like Square it can accept MasterCard, Visa, Discover and American Express. The card reader itself works in much the same way as the Square does and there are 2 different fee plans to choose from. If you are a small volume user (under $1,000 a month in sales) Intuit recommend there no monthly fee plan which charges 2.75% per transaction. For those doing sales of over $1,000 a month by paying a monthly fee of $12.95 a month that per transaction fee is reduced to 1.7%. If you really intend to make heavy use of the GoPayment system with an iPhone or iPod you may want to consider investing in something called a Morphie. Instead of having to put a little card reader into the headphone socket this iPhone/iPad case lets you swipe the card through its built in slot at the bottom, something that is a little less cumbersome and maybe a little more professional looking. The Morphie costs around $79 but it is not available for iPad or other phone models yet.